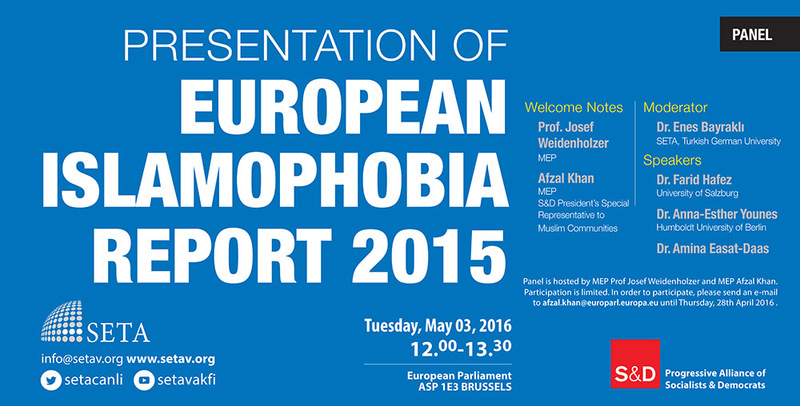 We are pleased to announce that the Presentation of European Islamophobia Report 2015 will be held in Brussels, European Parliament on 3rd May 2016. The Panel is kindly hosted by MEP Josef Weidenholzer and MEP Afzal Khan. Prof. Josef Weidenholzer and Afzal Khan will give an opening speech at the panel. Assist. Prof. Enes Bayraklı, who is the co-editor of the European Islamophobia Report 2015 and SETA European Studies Director, will be moderator of the panel. In panel, first speaker is Dr. Farid Hafez from Salzburg University who is the co-editor of European Islamophobia Report 2015 and at the same time author of the Austria Islamophobia Report. The panel will continue with the second speaker Dr. Anna-Esther Younes from Berlin Humboldt University who has written Germany Islamophobia Report 2015. Moreover, Dr. Amina Easat-Daas is one of the speakers in the panel who is also the author of the Belgium Islamophobia Report 2015. The aim of the yearly ‘European Islamophobia Report’ (EIR) is to document and analyze trends in the spread of Islamophobia in various European nation states. The European Islamophobia Report (EIR) is an annual report, which is presented for the first time this year. It currently comprises 25 national reports regarding each state and the tendencies of Islamophobia in each respective country. The current report features the work of 37 extraordinary scholars. The participation is limited. In order to participate, please send an e-mail to afzal.khan@europarl.europa.eu until 28th April 2016.